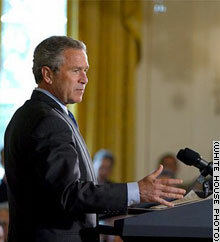 WASHINGTON (CNN) -- President Bush called on Congress Tuesday to pass a $15 billion initiative to fight the spread of AIDS in Africa, amid criticism from conservatives in his own party who are unhappy over some details, such as the emphasis on condom use. "We can turn our eyes away in resignation and despair, or we can take decisive, historic action to turn the tide against this disease and give the hope of life to millions who need our help now," Bush said in a speech in the East Room of the White House. "The United States of America chooses the path of action and the path of hope." The Bush proposal is modeled after a program in Uganda known as the "ABC" approach: abstinence, being faithful in marriage, and condoms, as the order in which people are told to conduct themselves to avoid contracting the deadly disease. Since Uganda implemented the program, the AIDS infection rate has fallen dramatically and, in places in the country, the percentage of pregnant women with HIV has been cut in half, Bush said. "Congress should make the Ugandan approach the model for our prevention efforts under the emergency plan," Bush said. Nearly 30 million people in Africa are HIV-positive, including 3 million children under the age of 15. In the South African nation of Botswana, nearly 40 percent of the adult population has HIV and the projected life expectancy there has dropped by more than 30 years due to AIDS, Bush said. If passed, Bush's plan will direct $15 billion to fight AIDS abroad over the next five years, beginning with $2 billion in 2004. It will concentrate on 14 countries in Africa and the Caribbean that have been devastated by AIDS. Saying "time is not on our side," the president urged Congress to expand "what works to save lives." "We will focus intensely on 14 ravaged countries to show the world what is possible. This is a terrible disease, but it is not a hopeless disease," Bush said. He also called on other nations to join the "massive and complicated undertaking." "Our nations have the ability and, therefore, the duty to confront this grave public health crisis," he said. The speech marked Bush's first on the issue since first proposing to triple U.S. spending to combat HIV/AIDS in his State of the Union address in January. Although House International Relations Chairman Henry Hyde, R-Illinois, a well-known social conservative, is the lead sponsor of the initiative, it is drawing fire from some in his party who say promoting abstinence must be an explicit priority over condom use. Rep. Mike Pence, R-Indiana, and Rep. Joe Pitts, R-Pennsylvania, will offer amendments to "codify" prioritization for abstinence funds, when the full House votes later this week, according to aides to both congressmen. Hyde was able to quickly push the issue through committee last month. Sam Stratman, Hyde's spokesman, said conservatives need to recognize that "for the first time in 20 years, the left is acknowledging that abstinence works." Another sticky dispute has been whether these federal dollars will go to international groups that promote abortion. Hyde avoided re-igniting a long-time partisan fight over the policy by allowing those organizations to receive the money as long as the abortion programs are organized and financed separately. AIDS activists, including international rock star Bono, are hailing the legislation and the president for shining the spotlight on the issue. "This event at the White House shows how the president's renewed and reinvigorated leadership on AIDS is matched by leaders on both sides of Congress and the leadership of the American people," said U2 lead singer Bono, founder of the group Debt, AIDS, Trade and Africa. Pence and Pitts, among others, are also likely to propose a "conscience clause" amendment, allowing faith-based organizations, like the Catholic Church, who want to receive the federal dollars to opt out of programs they object to, like distributing condoms. The White House is making clear to conservatives they are open to amendments. "Some amendments may be offered, and we are supportive of that," said spokesman Scott McClellan. The president proposed $200 million per year for the fund, but the House version of the bill increased that to allow him to give up to $1 billion per year for five years.